If you’ve been struggling with a leaky showerhead, it may be caused by these common issues. Leaks in your home can be such a drag to deal with. Sometimes once you think you have the solution to your leaky issue, you find that the drip drops from the leak continue to persist and bother you. This can be especially problematic with show heads, as the leaks can become quite annoying to listen to constantly. There is also the issue that leaky shower heads as the water coming from the leaky showerheads can result in water bills quickly skyrocketing, which will seriously hurt your wallet before you even pay for any repairs you need to fix the shower heads. If you need help in trying to determine the cause behind leaky showerheads, take into consideration these potential causes. 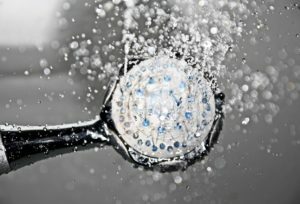 If a leak is present in shower heads, then you may need to closely examine the shower heads in question because the seal on them may very well be worn out. Whenever a seal becomes broken on shower heads, a leak is usually soon followed. The washers and O-rings are no longer doing the job of preventing the shower heads from leaking. It is not uncommon for these seals to break or harden, resulting in leaks. Fortunately, they are not too difficult to fix yourself. By taking apart the shower heads, you can take the broken seal out and bring it with you to the store to find a match for it that can soon be installed for leak-free shower heads. Shower heads might also be leaking due to clogs in the holes. As time goes by, the water holes in shower heads can easily become clogged with mineral deposits, blocking the pipes from emitting water through those holes. When this happens, water will begin to leak out of the shower heads through the face plate, handle, or pipe itself. To get rid of this blog and fix your leaky shower heads, you cover the shower heads with a plastic bag filled with vinegar overnight. Then, the next day, scrub the shower heads with a small brush to rid it of those pesky mineral deposits. Sometimes, shower heads are leaking due to issues stemming from their handles. The leak in the shower heads, in this case, are often found when the hot and cold water are separated by two different handles. The seal behind these handles, again, may be broken. Meaning that you will have to take them off to see which one is broken and replace the seal for it. Although if this or any of the previously mentioned solutions do not do the trick, you can always call in the professionals to assist you with the leaky showerheads. This entry was posted on Friday, November 30th, 2018 at 1:53 pm. Both comments and pings are currently closed.